I don't usually post meat-based dishes on this blog, but now that fall has arrived and temperatures are starting to drop, a hearty, comforting meat-and-potatoes recipe seemed appropriate. Our freezer is stuffed with meat from our CSA and I've really enjoyed trying out new recipes for the various cuts of meat that we receive. We recently got some lamb sausage, which I decided to use for this cottage pie, adapted from Dorie Greenspan's Hachis Parmentier recipe in Around My French Table. While the original recipe uses beef stew meat and pork sausage, I used ground beef and lamb sausage. 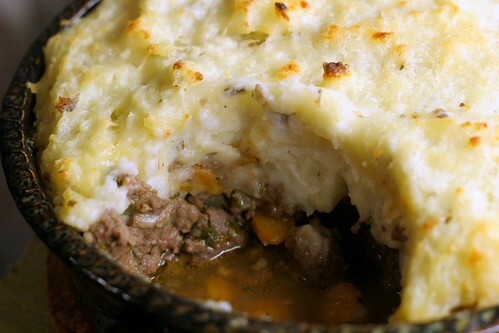 This is comfort food at its best - warm, tasty, and filling. I especially enjoyed the thin layer of cheese that topped the mashed potatoes, which formed a nice crust as the pie baked. Cooking and eating this cottage pie today has made me finally accept that fall is here for real, and I'm ready to enjoy the beauty of the season and the foods that go with it! What is your favorite comfort food for when the weather turns cold? Feel free to change the combination of meat here to suit your preference - any combination of ground beef, ground lamb, lamb sausage, or pork sausage will be delicious. Heat a splash of olive oil in a large, heavy pan over medium heat. Add the onion, garlic, and carrots and saute until the vegetables begin to soften, about 5 minutes. Stir in the parsley, then add the ground beef and sausage. Cook, breaking up large clumps, until meat is just cooked through and no longer pink, then drain excess fat. Add tomato paste and mix it in well with the meat. Add the stock or broth, bring to a boil, and boil for 2-3 minutes. Remove pan from heat and season mixture to taste with salt and pepper. Put the quartered potatoes in a pot filled with cold, well-salted water. Bring water to a boil and cook potatoes until they are tender and can easily be pierced with the tip of a sharp knife, about 20 minutes. While potatoes cook, place a rack in the middle of the oven and preheat oven to 400 deg F. When potatoes are done, drain them well. When potatoes are cool enough to handle, remove the peels and pass them through a food mill or potato ricer, or mash with a large fork. Warm the milk and cream (I just microwaved them), and stir them into the mashed potatoes. Cut the butter into small bits and blend them into the potatoes. Season potatoes to taste with salt and pepper. Butter a 2-quart casserole dish. Put meat mixture (with the liquid) in the dish, and top with the mashed potatoes, spreading the potatoes evenly out to the edges of the dish. Sprinkle the grated cheese over the top of the potatoes. Place the casserole dish on a baking sheet lined with foil or a silpat mat (this will catch any drips), and bake in the preheated oven for 30-35 minutes, until the filling is bubbling and the potatoes have developed a golden brown crust. Remove from oven and let sit 5 minutes before serving. Looks delicious. 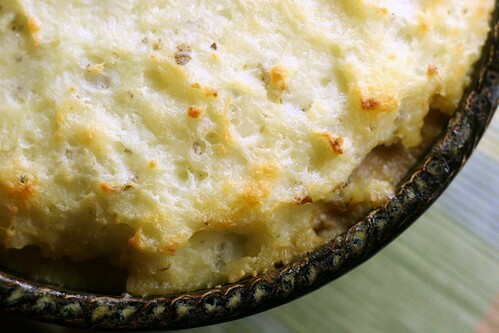 Lamb isn't something I cook regularly, but I love Shepherd's pie and other cool weather comfort foods like these. Mmm lamb sausage sounds perfect for this dish! So comforting. This looks like definite comfort food! I love making all sorts of soups when it starts to get colder out.